Touch of Power is the story of Healer Avry, a woman who has lost her family, her livelihood, and her dignity. The only thing that remains is her will to live but even that is at war with her innate instinct to heal – especially children who needlessly suffer. The only problem is Healers are treated as outcasts who lives are forfeit for something she’s not even sure was the fault of her kind… the coming of the plague. When she is abducted by a band of rogues, she wonders if sealing her fate sooner would have been better than later. This is the first book in a new series by Snyder. Book three, Taste of Darkness, will be released December 31st, 2013 and I can’t wait. I have followed Snyder’s career right from the beginning with the Study Series and I have yet to be disappointed with her work. While her writing since then has not been of the exact caliber, her world building and character believability continue to be strong points in her craft. In this book, and series, I am particularly attracted to the division of magic and the seeming randomness of having the power-gene in your family line or not. Readers learn that Avry’s power, the ability to heal, works differently. While it is true that the foundation of magic remains similar, linked via genetic coding, how Healers come into their power and why is an insatiable mystery throughout this compelling tale. I must also note the realistic interaction between Avry and her captors. The interplay of trust in captivity coupled with something more than Stockholm syndrome thickens the plot in a natural and unforced way. My only cause to pause and not award her latter books, including Touch of Power and the Healer Series, a perfect score could be construed as a contradiction in terms of writing – there’s too much suspense. 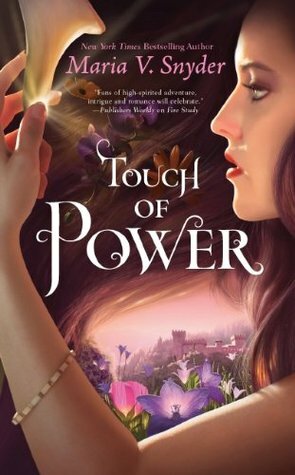 Nearly every chapter in Touch of Power ends in a cliff-hanger. While it’s true that this builds tension and each moment of suspense is elevated where you can’t believe something worse could happen – it is tiring. As a reader, the pull to ‘have to’ read the next chapter slowly frays the nerves. Remaining at such a heightened state of emotion throughout much of the book wears me out. I do not feel a balance – even Shakespeare knew to follow a particularly heavy scene with a brief comical one in order to relieve the viewers of tension and allow them emotional room to build up to the next big event. Regardless of this minor flaw, Snyder continues to be one of my favourite authors as I wait with bated breath for December 31st and not December 25th.